The 19th century author Lewis Carroll was always fond of riddles, and his riddle of the Two Clocks was instrumental in the creation of Schrödinger’s Clock®. "The latter," you reply, "unquestionably." Very good, now attend. I have two clocks: one doesn't go at all, and the other loses a minute a day: which would you prefer? "The losing one," you answer, "without a doubt." Now observe: the one which loses a minute a day has to lose twelve hours, or seven hundred and twenty minutes before it is right again, consequently it is only right once in two years, whereas the other is evidently right as often as the time it points to comes round, which happens twice a day. "Ah, but," you say, "what's the use of its being right twice a day, if I can't tell when the time comes?" Why, suppose the clock points to eight o'clock, don't you see that the clock is right at eight o'clock? Consequently, when eight o'clock comes round your clock is right. "Yes, I see that," you reply. You might go on to ask, "How am I to know when eight o'clock does come? My clock will not tell me." Be patient: you know that when eight o'clock comes your clock is right, very good; then your rule is this: keep your eye fixed on your clock, and the very moment it is right it will be eight o'clock. There, that'll do; the more you argue the further you get from the point, so it will be as well to stop. Antony Hurden, the inventor Schrödinger’s Clock, was standing on a street corner in Wilmington (Vermont, USA) and noticed that the church clock had stopped. From where he was standing, he could see two faces of the clock, and that each face showed a different time. 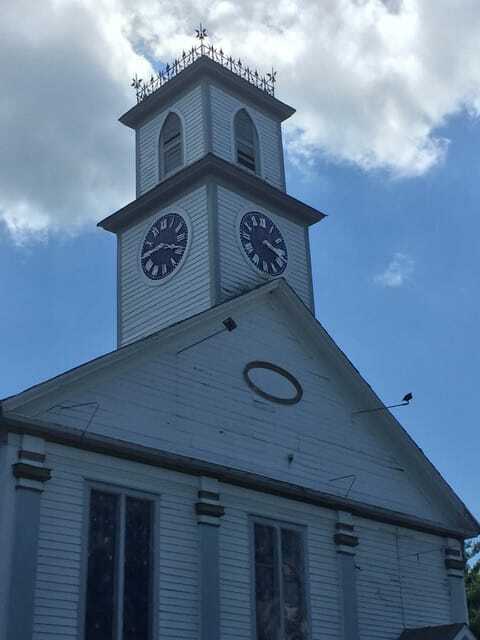 Thus, the church clock in Wilmington could be observed to be right four times a day. Or, using more modern terminology, its normal state is usually to show the wrong time, but four times a day, the clock changes state to show Now – i.e. the right time. He happened to be holding a book on quantum mechanics (having just bought it in Bartleby’s Books in Wilmington), so Lewis Carroll’s riddle, the church clock in Wilmington, and quantum mechanics all came together to seed the idea for Schrödinger’s Clock®. 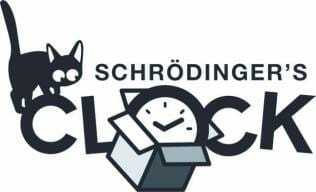 Antony Hurden, the inventor Schrödinger’s Clock, was standing on a street corner in Wimington (Vermont, USA) and noticed that the church clock had stopped. From where he was standing, he could see two faces of the clock, and that each face showed a different time. Thus, the church clock in Wilmington could be observed to be right four times a day. Or, using more modern terminology, its normal state is usually to show the wrong time, but four times a day, the clock changes state to show Now – i.e. the right time.